fab card Sylvie, really love how you've made the tree stand on on this. You're right it really is a small world. Enjoy your Sunday...we have a lovely crisp frost here this morning! Ooh I like this !!! I forgot about my icicle border !!! Love this card !!! This is gorgeous Sylvie, I like the snowman image the icicle border and the tree. A lovely card Sylvie, love the snowman & gorgeous icicles. Another festive stunner Sylvie. Glad you're enjoying the sunshine! Its just gorgeous Sylvie and the dark background really makes the images pop. Lucky you in the sunshine!! Cute as punch - I love the icicles are wonderful and the snowman so very cute. Absolutely adorable card Sylvie and gorgeous too. Gorgeous card as always Sylvie. 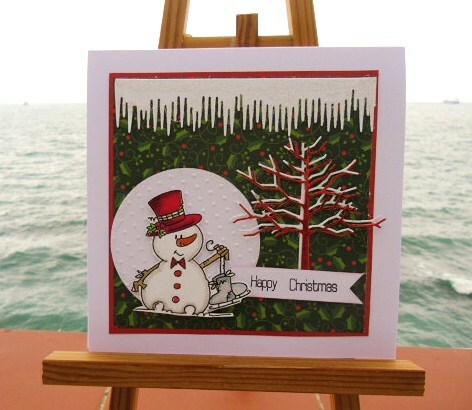 Love the snowman and that fab icicle border.